Tone Nødtvedt says Svalbard Church still looks pretty much the same as when it opened 60 years ago and became her childhood home because her father, Erling, was its first priest. It’s spirit is also largely the same, thanks to a main interior where the social gathering space was vastly expanded from the original plans – making it larger than the space for services – at her father’s insistence. 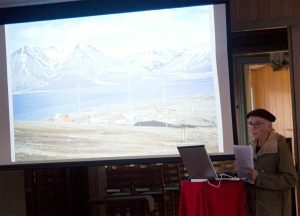 Tone Nødtvedt presents a slideshow about life in Longyearbyen in the 1950s on Tuesday at Svalbard Church, where her father was the first priest when the church opened in 1958. Photo by Mark Sabbatini / Icepeople. “He wanted it to be a place for the workers,” she said, noting there was a shortage of places for them to gather for creative and social activities at the time. Nowadays a “fireplace social” with waffles and coffee takes place every Tuesday evening. 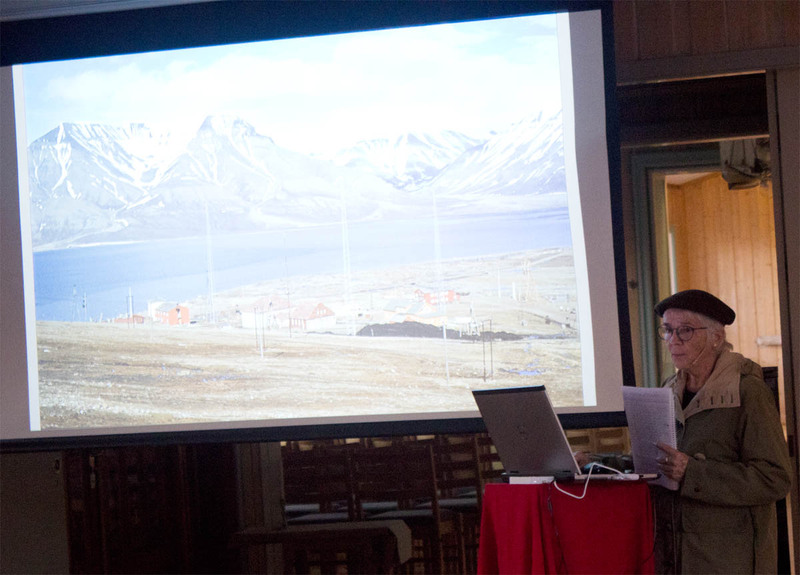 Nødtvedt, who left Longyearbyen with her family when she was nine, returned to the world’s northernmost church during this week’s gathering to present pictures and stories about her early experiences at the church and elsewhere in Longyearbyen during the 1950s. It was one of a series of events celebrating the church’s 60th anniversary that includes a birthday party Saturday afternoon, a celebratory Mass on Sunday morning and a concert Sunday evening. Nødtvedt said that in addition to the building remaining much the same, there’s also similar qualities between her father and the current priest, Leif Magne Helgesen, in terms of their active hands-on approach to community involvement. Helgesen, who is departing early next month to become an ambulant seaman’s minister in Asia, said he timed his departure to ensure he would be here the for landmark anniversary. He will preside over the celebratory Mass along with Bishop Emeritus Per Oskar Kjølaas. Photos taken by Nødtvedt’s father showing the church’s construction and early days that she posted on her Facebook page prompted plenty of people to offer momentary and long-time memories. 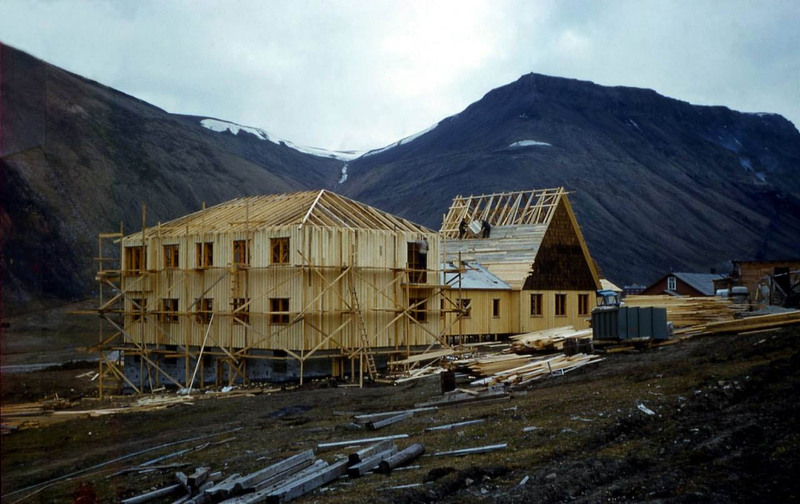 Planning for the church began after World War II because the former church, like most buildings in Longyearbyen, were destroyed during the war. But it took nearly a decade before it officially opened on Aug. 24, 1958. • 1 p.m.: Birthday party for all ages featuring food, games and music. • 11 a.m.: Mass celebrating church’s 60th birthday by Priest Leif Magne Helgesen and Bishop Emeritus Per Oskar Kjølaas. • 7 p.m.: Concert by Ole Paus. • 7 p.m.: Presentation: “The Church in the North” by Bishop Emeritus Per Oskar Kjølaas.